My favorite part of the class was the panel discussion. Four green business owners and four leaders of sustainability in the non-profit sector spoke about their work creating or maintaining their organizations and the challenges they face. Here's a little taste of what the panelists had to say. Green Apple is no ordinary dry cleaner. And they're not one of those so-called "organic" cleaners either. To clean clients' clothes they use liquid CO2 that was recaptured from processes like beer brewing. In a Consumer Reports study, CO2 dry cleaning was found to be the most effective dry cleaning method, beating out conventional, toxic perchloroethylene (PERC)-using dry cleaners. Green Apple's pick-up and delivery service, which is powered by biodiesel, is so far only available in Manhattan and North Jersey. David hopes to open a Brooklyn location early next year (I hope so!). Mark was an environmental lobbyist and his wife, Samantha was a buyer for Fishs Eddy. So it was only natural for them to open a store like 3R Living. It's a great resource for eco-friendly gifts and housewares, with two locations: Park Slope, Brooklyn, and Maplewood, NJ. Though the towns aren't so near to one another, Mark said it was a fairly easy decision to open the second Maplewood store, since so many Park Slope transplants now live there. Green Depot is an amazing source for green building supplies. Some of the notable projects they've supplied include the new Brooklyn Center for Urban Environment building, the platinum LEED certified Bank of America Tower, and Entourage star Adrian Grenier's Brooklyn townhouse. *When we were having coconut palm composite (DuraPalm) flooring installed in our kitchen last year, it didn't go so smoothly. The carpenter laid down the entire floor using traditional wood floor nailing methods. Almost every board ended up cracked or split. He had to rip up the entire floor and we had to checked every single board for damages to see which pieces were salvageable. Not fun! His trucks run on biodiesel and instead of wasteful cardboard boxes, Mark's company uses reusable plastic ones he calls GothamBoxes. At the end of the business year, Mark gave part of the company's proceeds to the Prospect Park Alliance to support a New York City green space, and in a way, offset carbon. He plans on contributing to environmental organizations as a regular business practice. A discount -- what better incentive for bringing your own bag? (Well, aside from knowing you're not creating waste.) 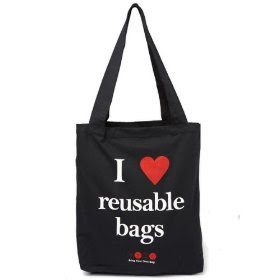 If you BYO bag to eco-fashion store Kaight, you'll get 10% off any purchase in the store. Love it! In these times, even the smallest things can make a big difference. For instance, being wasteful simply isn't good: not for our wallets and certainly not for our environment. So, going forward, refuse a bag with your next purchase at Kaight, and we'll give you 10% off, no matter how tiny or large the purchase. We've got some incredible scarves, mittens, coats, shoes -- the list could do on forever -- in stock. So grab one of the gazillion totes you've got lying around and receive 10% off your next, and then your next, and your next (see where we're going with this?) purchase.